Puerto Morelos is “a sleepy little drinking town with a fishing problem,” nestled on the coast of somewhere picturesquely beautiful. Situated between the two hot tourist destinations of Playa del Carmen and Cancun, it’s an excellent option for peace, quiet and relaxation. Because of how small the actual city is, there aren’t a whole lot of hotels to choose from. There are a good number of vacation condos, houses and apartments that are incredible, though. Here are a few of the options we think you will like. All of the beachfront hotels in Puerto Morelos are small and simple; they are not like the big resorts with all the bells and whistles and accoutrements. You will get a bed and A/C, possibly a simple kitchen or kitchenette along with a few other creature comforts. Most importantly though, you get a stunning beach and ocean view. Hacienda Morelos is located at the south end of town just off of the town square. It’s hard to beat the location and convenience of this hotel since it’s so close to many of the restaurants and shops in town. Hacienda also has its own seaside restaurant. Take advantage of it while sipping your morning coffee. The original hotel, Arrecife I, is at the north end of town (roughly a 15 min beach walk to the town square). This hotel has one of the best private beaches in all of Puerto Morelos; with lounge chairs and personal palapas (palm thatched shelters), for guests. Each suite has its own balcony overlooking the beautiful blue green water of the Caribbean Sea–a very nice aspect to this hotel. Arrecife II is located behind Arrecife I, steps away from the beach. It’s a recent edition (built 2014), and has its own pool and even posher suites than the original building. Ojo de Agua is centrally located along the seaside of Puerto Morelos, roughly a 10 min beach walk to the town square. It’s the only hotel in town that has a beach club–and a pretty sweet happy hour–as well! Many of the rooms here don’t have an ocean view but the hotel is situated on the beach. Also noteworthy is they provide excursions and activities through their own dive shop (Wet Set Diving Adventures). There are paddle boards, SCUBA diving and snorkeling tours all right there, which is super convenient if you want to do any water activities. There are only a few big all-inclusive resorts that are actually in Puerto Morelos, which is one of the factors that keeps Puerto as quiet and charming as it is. 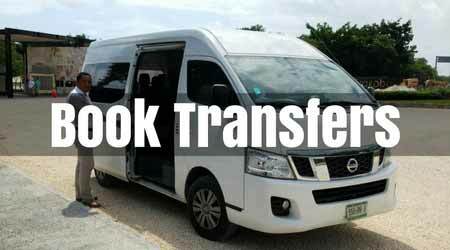 There are around a dozen resorts that are on the federal highway close to town, but the only realistic way to get back and forth is by taxi or rental car. TIP: The beach does not connect with the beaches in town as there is a maritime port that separates the two. If you did want to walk to town, you would have to walk via the road the entire way. El Cid has its own marina which provides diving, snorkeling, fishing charters, day cruises on their 50-foot catamaran, and they have a recently developed dolphin discovery park where you can swim with dolphins. Now Jade sits just to the south of El Cid, about 3 Km south of Puerto Morelos’ main town square. It is fairly large, with 550 suites, and enjoys 2600 feet of pristine beachfront property. It’s family-friendly, with several swimming pools and a world-class spa and fitness center. Desire is an ADULTS ONLY resort that is just north of Puerto Morelos about 0.5 Km. If you want a very ‘natural’ experience you can stay here–it’s a clothing-optional resort. It’s conveniently located to town, but there is a long stretch of undeveloped beachfront property that separates the resort from Puerto. 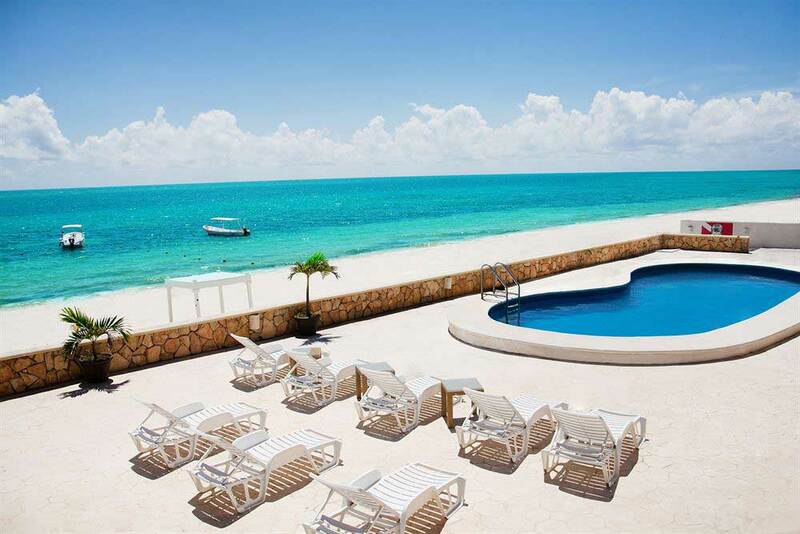 Arguably the best way to experience what Puerto Morelos is and what it has to offer is by renting a condo. There are hundreds of options, depending on your budget and style. The seaside neighborhood in Puerto Morelos is only three blocks wide, so whether the condo you rent is directly on the beach or not, you are no more than 3 blocks away from the sea! Most condos you rent will give you the option of pre-stocking the unit with groceries before you arrive, so you have the essentials as soon as you get in. Here are a few of excellent vacation rentals located right in town. These authentic 6 condos consistently receive “outstanding” reviews from guests. They are affordable, clean, located very close to the beach and provide ample space. The owner takes care of guests and the property so you can leave any worries far from the front door. Each unit has a full kitchen, ocean views and a private walk-out poolside patio with cozy lounge chairs. The larger condos have upper levels with their own rooftop terrace and balconies. 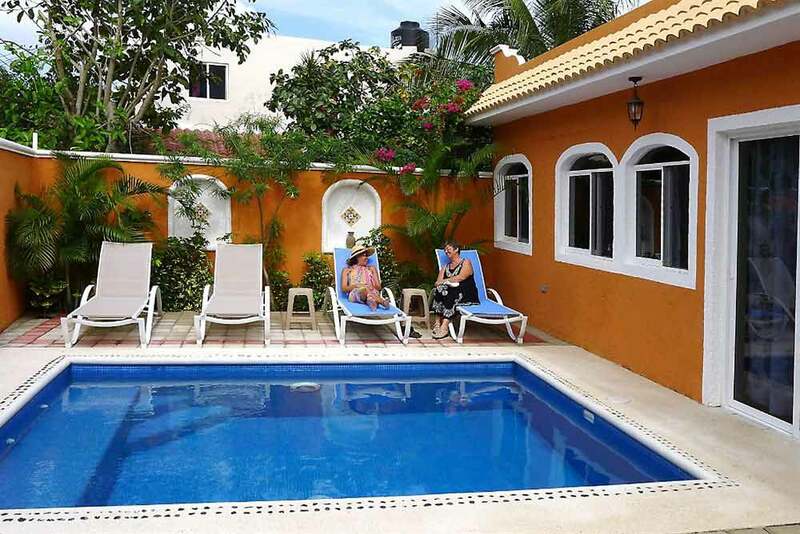 Las Casitas has its own private swimming pool and hot tub, as well as private beach area. They provide beach chairs, umbrellas and coolers, along with everything you might need for your sunny beach days. Full-time caretakers are on the property to assist you with any needs or questions you might have (they don’t speak a lot of English though). Las Casitas can be perfect if you are just traveling as a couple or a with a few friends; it makes for an excellent option! If you’re traveling as a family or maybe as a group of couples, these are two fantastic homes that are situated right beside each other. This 5 bedroom, 5,000 square foot home provides a dream vacation. Both homes have their own private infinity pools, as well as a private beach front area. These houses are also located on arguably the best stretch of Puerto beach, on the far north end of town. It is the furthest from the square you can get and still be in the town of Puerto Morelos. The beach is fantastic and quiet. Four bicycles are provided with the rental, so if you don’t have a car or don’t feel like walking, you’re only a short bike ride from the square. 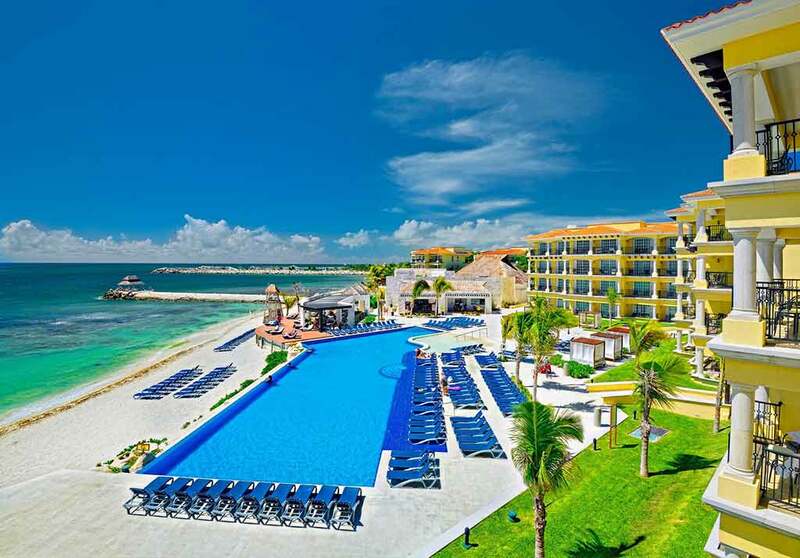 Just to the south of Casa Margarita–still on the beautiful, quiet north end of Puerto Morelos beach–is an 18 unit condo complex called Casita Blanca. The 18 units are housed in 3 different buildings. Unlike the condos mentioned above, these are all individually owned and rented separately. Usually these units can be rented at very good rates, depending on the season. With that being said, obviously the décor and furnishings will vary from unit to unit. The grounds are very nice and well-maintained, with a large pool in the common area. This property also has a roped-off section of beach with lounge chairs and palapas. Similar in many ways to Casita Blanca is Villas Playasol. This is a beautiful complex of individually-owned units also. It is a bit of an older property, but many of the condos have been renovated or are in the process of being updated. There is a large swimming pool in the center of the buildings. The best part is that our pricing and selection comes directly from the largest online websites like Expedia.com and Hotels.com. What this means is that you are getting the best price and services available. We have 24-hour customer service agents and lenient cancellation policies to serve your needs.